Use a skillet or stir-fry pan large enough to hold all the pasta and sauce later on. Heat the skillet over high heat. Add the olive oil, then the garlic and red pepper flakes. After 30-60 seconds, add the prosciutto. After another minute, add the crushed and chopped tomatoes and sea salt. Simmer, uncovered, until the sauce thickens some; about 15 minutes total. Start the pasta after the sauce has been simmering 5 minutes (see below); add the parsley after sauce has been simmering 10 minutes. About five minutes after the sauce begins to simmer, add the penne to the boiling water and cook on a high boil, uncovered, stirring often. Follow the box directions for the number of minutes to cook the pasta al dente. Drain the pasta once it is cooked al dente. Add the drained pasta to the sauce, lowering the heat to the lowest possible setting. Toss the pasta with the sauce. Add the vodka and toss again. Add the heavy cream and toss once more. 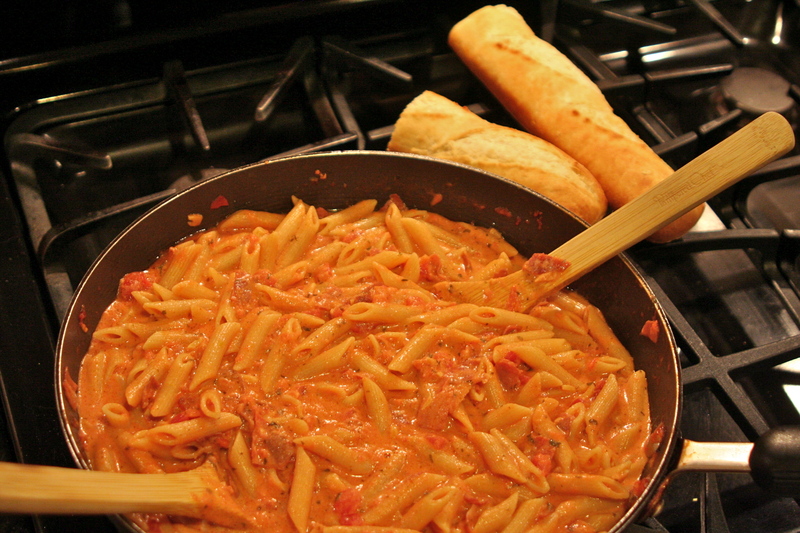 Cover the pasta and leave over the low heat, allowing 1-2 minutes for the pasta to absorb the sauce. Toss one final time. Transfer to individual pasta bowls and serve immediately, with warm bread. Serves 6.